A delightful and thoroughly enjoyable read: in my many years of reading environmental books there aren't many I could say that about. I found The Seed Undergound on a table at the home of a member of Transition Mar Vista/Venice, at an open house (open garden) as part of last month's 100+ home Mar Vista Green Garden Showcase. The book's quirky handwritten double-entendre title called to me -- plus it was about SEEDS. The cover photo looks a bit like the shelves in my house. I opened the book to a random page, and after the first clever turn of phrase I was hooked. I kept reading humourous excerpts aloud to anyone at the event who would listen. The Seed Underground is a wonderful and heart-warming story, a treasure hunt in the best, most joyous meanings of the phrase. 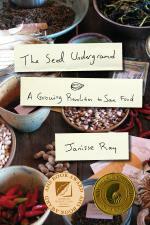 The book threads together a series of personal vignettes as author Janisse Ray seeks and collects seeds for many varieties of heritage and heirloom food plants. In between the fun and funny stories, you'll get a solid and well-presented explanation of why seed saving is so important. You'll learn how climate change impacts our food crops. You'll get a huge dose of biodiversity depletion. You'll learn about the dubious efforts of seed vaults. You'll understand GMOs and why they are hideously dangerous, and you'll emerge with a more complete understanding of the vulnerability of our conventional food supply. Through it all, you can't help but pick up some plant breeding tips that go far deeper than "basics." Like: selection of which seed to save, varietal vigor, adequate population to sustain genetics, isolation, and a few tips on how to pollinate squashes. But overwhelmingly, The Seed Underground is a story of hope and of action. It is a story of people -- hundreds of them -- who love and care about seeds. Even as massive transnational corporations attempt to patent life and control the food supply, there are hundreds of people who are reengaging with the most basic cultural resource that human civilization has. The "underground" part of the title is about this quiet movement, and the subtitle of the book puts it quite honestly: A Growing Revolution to Save Food. The Seed Underground is a collection of stories of conservationists and traditional plant breeders: old people and young people who understand the preciousness and unique properties and cultural richness of our seed heritage. If you haven't already caught seed-saving fever, you stand a very good chance of catching it here. Seed saving is fun and addictive. Ask my teens and they'll roll their eyes and tell you of all the jars and bottles I have stashed away to bridge between seasons. Carouby de Maussane peas, whose beautiful purple and lavendar flowers give way to tender snowpea pods. The tiny 'Tavera' seed that looks like a white TicTac candy, and grows huge harvests of perfect pencil-thin green beans. The California native evening primrose I call 'Ballona Creek,' saved from a developer's bulldozer near my neighborhood around 2001. 'Ejotero' blackeyed peas, a Native American variety that thrives in searing heat, now acclimated to 8 years of Southern California summers. My own strains of chard, collards and amaranth, stabilized in Los Angeles terroir 5+ plant generations. I recently had to move my growing collection into a larger cabinet in our home. There's 'Tiger's Eye' bean that is beautiful maroon on a background that is the tan color of old leather. The angular blue-green seeds of molokheiya Egyptian spinach, which yield greens in hot weather. Delicious 'Christmas' lima bean that dries to gorgeous deep red on a creamy white ground, but swells to succulent full flavor in the cooking pot. And I have a box of rotating diversity, enough to "seed" a seed swap, given a hint of opportunity. Take a jar of 'Calypso' bean with its dramatic black and white markings that look like a yin/yang symbol. Pour them out across your palm and you'll be sorely tempted to pocket just a few. The Seed Underground is a book that captures the love of seed saving. Rather than "what we can/should do," this book captures what people are already doing, and you'll yearn to join in. Even if you cast aside the serious "solutions" aspect of it, this is fun and connections and rich grassroots American heritage. If you're not already a seed saver, this book may easily tempt you over. In any event, after you read it, I highly doubt that commercial warehouse-store seeds will hold much interest for you anymore. For your table, your garden, your children, for your connection to cultural richness, for your future, you will reach for heirloom seeds. Joanne Poyourow is seriously addicted: her seed collection threatens to take over every room of the family home. And where there aren't seeds, there are books ... including her own books, the latest of which is 10 Practical Tools for a Resilient Economy: A Toolkit for Grassroots Survival. Joanne is the director of the Environmental Change-Makers nonprofit, the "initiating group" for the Transition Movement that is now unfolding in many areas of Los Angeles.